Very spacious, private and plenty of room. Nice property, spacious, private and a really good outdoor seating area. Could do with some barbecue utensils and proper grill rack, also would benefit from some lighting around the barbecue and table. Another parasol would also be beneficial. All in all we had a great holiday. Had an amazing stay at the villa. Beautiful pool area with plenty off sunbeds and barbecue area. Outstanding villa. Great bedrooms with en-suites. Beautiful balcony area upstairs. Very well furnished, all appliances in large kitchen, plus spacious indoor living area. Outside fantastic pool area, very spacious with shady seating area. Short walk to supermarket and restaurants, bars etc. 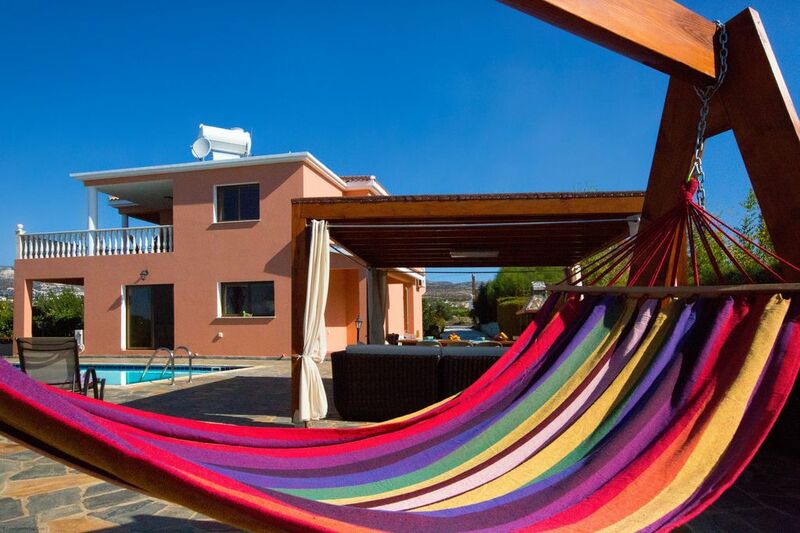 This charming villa is situated within 800 metres of Peyia Village where you will find three supermarkets, banks, baker, wet fish shop and many bars/restaurants offering good local food at reasonable prices. Coral Bay the best sandy beach in Western Cyprus, is within five minutes' drive. The whole region has breathtaking views over the Mediterranean Sea and spectacular sunsets. Paphos is within a 15 minute drive. Here you can visit the harbour area with its many bars and restaurants and watch the world go by. The cultural centre of Paphos is the Tomb of the Kings where you will UNESCO World Heritage Site, there are also wonderful mosaics at Paphos harbour. Horse riding, Paphos Zoo and beaches are within a five minute drive. Supermarkets, local shops, bank, medical centre, bars and restaurants within a five minute drive. Four championship golf courses within a 40 minute drive (Elea, Minthis Hill, Secret Valley and Aphrodite Hills). Latchi - is a wonderful place to visit; drive through the hills and vineyards behind Peyia until you drop down to the beautiful Bay of Aphrodite with stunning views over the the hills and Mediterranean. Here you will find a picturesque harbour next to a number of good fish restaurants. You can also take a boat trip or try some watersports at Latchi! Restaurants - there are many good restaurants in the area. Taverns at Kathikas are particularly recommended. Wineries - there are a number of wineries you can visit in the Paphos region. Watesports - are available at Latchi and Coral Bay.